Neuroimaging shows the effect of hunger on the brain’s response to food cues. The decision to engage in food-seeking behaviour depends on homeostatic signals relating to energy balance and the presence of competing motivational drives, as well as learned brain cues signaling food availability. It is known that the needs of the body can direct behavioural and neural processing toward motivationally relevant sensory cues. For example, human neuroimaging studies have consistently found specific cortical areas with biased responses to food-associated visual cues in hungry subjects, but not in sated subjects. Now, two studies from researchers at Beth Israel Deaconess Medical Center sheds light on how the needs of the body affect the way the brain processes visual food cues. The team state that in their two newly-published studies, they examined, with unprecedented resolution, the brain circuits responsible for the differences in the way the brain responds to visual food cues during hunger versus satiety. Previous studies show that it is highly desirable to understand how specific brain circuits bias attention to food cues, as these biases are powerful drivers of food consumption. Ideally, specific cell types within these circuits could be targeted in order to shift attention away from unhealthy cues such as high-calorie food cues. In a study published in the journal Neuron, the lab recorded images of brain activity in mice across different states of hunger and satiety. Mice were trained to discriminate among three visual cues associated with a high-calorie liquid treat, a bitter liquid or nothing at all. Results show that in food-restricted mice, just being shown the visual cue associated with the liquid treat provoked a strong response in sets of neurons in three different brain areas. Data findings show that when these same mice were tested after a meal, the same food cue produced a decreased response in the neurons in a subset of these same brain areas. 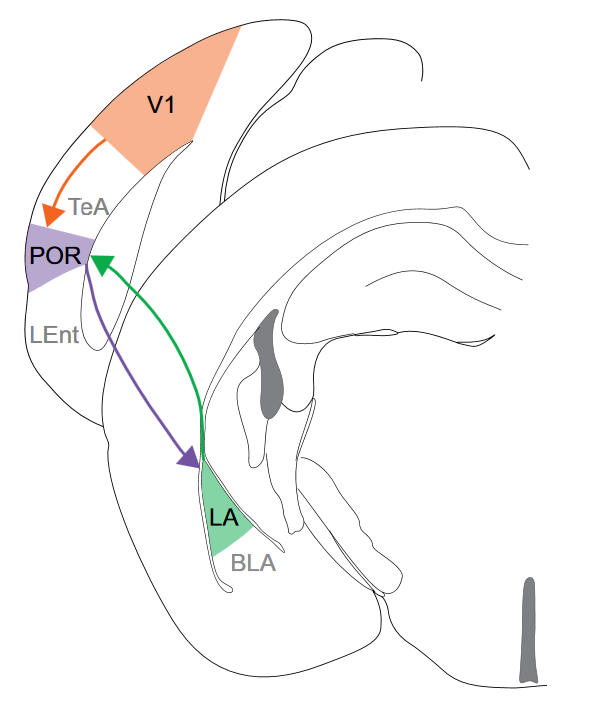 The group used this information to map the circuitry controlling motivation-dependent processing of sensory responses. The team state that they observed visual information about food cues is processed in sequential stages. Results show that later stages of visual processing vary when the mouse is hungry versus sated, while the earlier stages are less state-dependent. Data findings show that neurons in two regions of the brain, the postrhinal association cortex and the lateral amygdala, help integrate information about external food cues and hunger state. The researchers hypothesize this same brain circuitry could be involved in integrating other motivational drive states such as thirst. They go on to add that this turns out to be very similar to the situation in humans, and they hope this new model can be used to study the circuitry underpinning the brain’s responses to food cues in health and in obesity. In a study in the journal Current Biology the lab investigated how natural and artificially-induced hunger affects food-seeking behaviour, even in threatening contexts. Mice were placed in an arena where they had been trained to seek food after seeing visual cues associated with either a food reward or a mild shock to the feet. The team then compared the behaviour of well-fed mice to that of mice that had been on a restricted diet for 24 hours. Results show that food-restricted mice avoided shocks much less frequently than fed mice, continuing to seek food even after being shown the visual cue associated with a shock. Data findings show that the motivation to eat overpowered the tendency to avoid threats; conversely, fed mice prioritized avoiding shocks over seeking more food. The lab then used a technique called optogenetics to stimulate specific neurons, namely the agouti-related peptide neurons (AgRP), known to induce food consumption in sated mice. Results show that when AgRP neurons were stimulated in sated mice well before being placed into the experimental arena, the animals behaved like naturally hungry mice. Data findings show that when mice were placed in the threatening arena prior to activation of AgRP neurons, they behaved more similarly to sated animals, prioritizing shock avoidance over seeking food. The group state that the observations suggest AgRP neurons help regulate competing drives, and in the face of competing motivations, the one that begins first can often prevail. The team surmise that their studies highlight a direct pathway of motivationally relevant food sensory cues, and these motivational drives are also relative to the onset of a competing drive, namely between learned food-seeking behaviour and entry into a threat-containing context. For the future, the researchers state that their findings may be helpful in understanding the motivation to restrict food intake in eating disorders such as anorexia, as well as the tug-of-war between the neural circuits driving food-seeking and those driving self-defensive behaviours. In Vivo Two-Photon Imaging of Head-Fixed Mice during a Go/NoGo Visual Discrimination Task. Schematic of a V1-POR-LA circuit. Preemptive Stimulation of AgRP Neurons in Fed Mice Enables Conditioned Food Seeking under Threat. Andermann et al 2016.